Today, Annakuta Mohotsava, is a very auspicious day. This day is observed in India during the month of Kartika. Many of Krsna's other sweet pastimes were also performed in the month of Kartika. In this month, under the guidance of Nanda Baba, the Vrajavasis observed Govardhana puja. They did this, having given up the puja of Indradeva, and that resulted in Krsna lifting Govardhana Hill on His little finger. Yasoda-devi bound Krsna in this very month, which is how the song Shri Damodarastakam originated. Kartika is also the month in which Krsna and the gopis performed Saradiya Rasa (Autumn rasa-lila). We should also remember that the Annakuta Mohotsava was also performed by Shrila Madhavendra Puripada, as we saw in the drama play. Madhavavendra Puri went to Vrajabumi,Vrndavana, and there he stayed on the banks of Govinda-kunda at Govardhana. One day, after taking his bath, he sat beneath a tree on the banks of Govinda-Kunda. 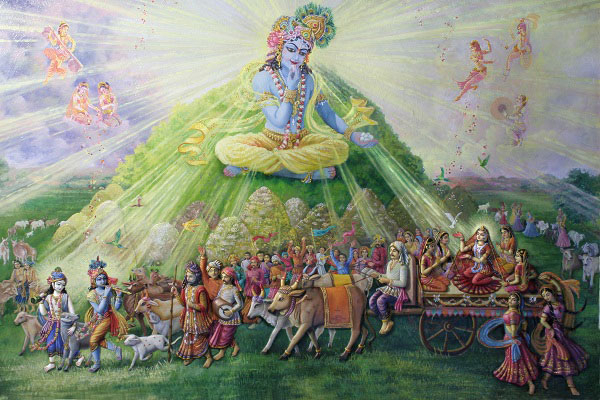 Krsna came there in the form of a cowherd boy and said to him, "Oh, why you sitting here, starving. No one starves here. My mother has sent some milk. Please drink it." Many sweet pastimes take place at Govardhana. For example, Shrimati Radhika, Lalita and Visakha and the other gopis are on their way to the fire sacrifice of Bhaguri Rsi. During their journey there is a discussion with Krsna. 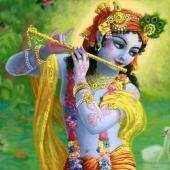 Krsna wants to check them and make them pay a toll tax, the gopis defeat Him, and He has to apologize. There is so much history there, and it is all coming in our mind and hearts. "May Govardhana Hill fulfill my deepest desire – to get darsana of Shri Radha and Krsna's lilas. By Shri Krsna's mercy Govardhana became the emperor of all mountains, and received the offerings meant for Indra despite Indra's enmity."